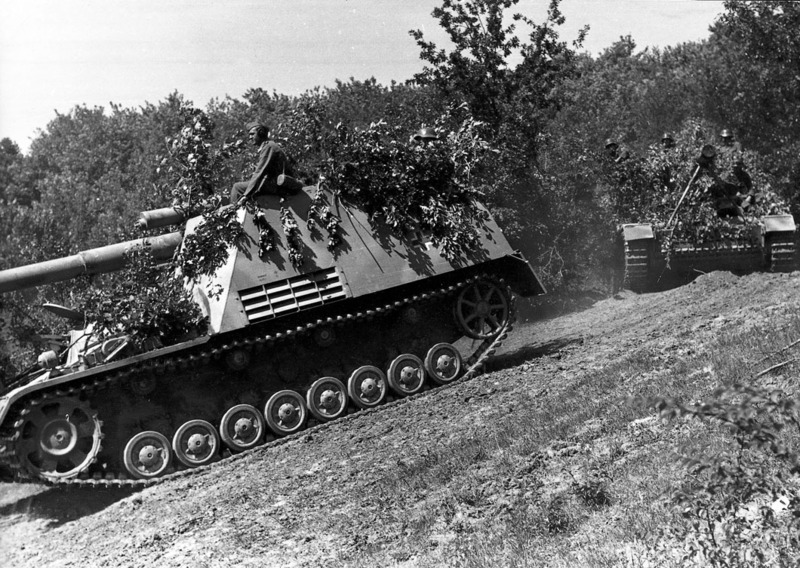 The Hummel was an attempt to provide armoured units with artillery support on a fully tracked armoured chassis. The 150mm sFH18/1L/30 gun was mounted on a Panzer IV chassis, though this was only intended as an interim measure until a chassis designed specifically for self-propelled gun platforms could be developed and produced. To accommodate the gun, the engine was moved forward to a central position, while the Hummel’s drive sprocket was of the type designed for the Panzer III. The open-topped fighting compartment was enclosed on all four sides by slanted armour plates bolted to the hull, while the glacis plate was extended and there was a small compartment for the driver on the left-hand side. The gun was mounted over the engine, which gave the Hummel a high silhouette. The specially designed ammunition carriers acted as supply vehicles for the Hummels, and 157 were built in total. The Hummel was issued to the panzer divisions, where they served in the heavy batteries of the armoured artillery detachments. At first each panzer division was equipped with six Hummels in a single heavy battery, though later a second heavy battery was added. They fought at Kursk in mid-1943, and continued in service until the end of the war in May 1945.